Summer is here, and that means lots of popsicles in our house! C doesn't eat much in the way of fruit or vegetables these days, but she'll eat almost anything in a popsicle, so we make popsicles and smoothies often. I was pleased with the look of the layered "rainbow popsicles" in the picture above (I know, they're not technically rainbows, but it's a fun name!). I don't have a real recipe for my fruit popsicles, just whatever is in the fridge and cupboard! These ones had tons of fruit. The orange layer had: mango, pineapple, peaches, pears, canned mandarins, orange juice, yogurt, and a drizzle of honey. I pureed it all in the blender and poured a layer into the popsicle molds. I added raspberries and strawberries to the orange puree left in the blender to make it pink, then poured another layer into the popsicle molds. Then I added blueberries and pureed it with the pink puree, and poured a purple layer into the molds. I dropped in the popsicle handles, then froze it - voila! Some people say to freeze the layers between pouring, but I didn't. The layers weren't perfect, but they didn't mix very much, and I didn't want to wait the extra time. 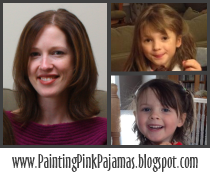 These are a big hit with C, and Hubby and I like them too! I'm always a little disappointed when she doesn't finish a meal, because then she can't have dessert and get a healthy fruit-filled popsicle! I've been meaning to mix some carrot puree into the rainbow popsicles, so I'll have to try that next time - it's almost time to make some more! We also make green popsicles, which I first tried around St. Partick's Day after reading this post on No Time For Flash Cards. I puree frozen spinach, bananas, yogurt, milk and a couple of drops of vanilla, then freeze the green smoothie into popsicle molds! Use ripe bananas, but not too ripe, or it will taste funny. For those of you thinking "spinach popsicles - gross! ", you can't really taste the spinach, it mostly tastes like bananas. I must admit they're not my cup of tea, but C loves them, and I'm all for dessert that gets a green vegetable into her!! C helps me make the popsicles, so she knows that spinach goes in them, but she still likes them, even though she'd never touch a spinach leaf on her dinner plate! 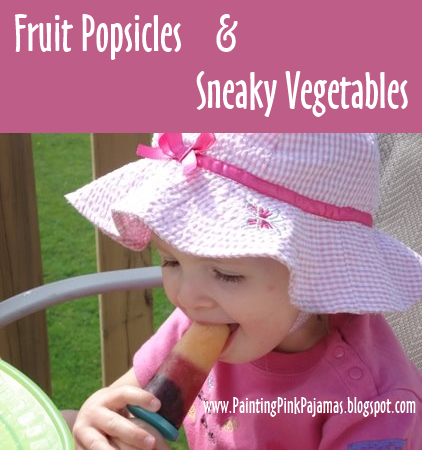 I've been making popsicles for quite a while, and since C has become more picky lately, I picked up the cook book Deceptively Delicious, all about hiding vegetables and fruit in your family's meals. I've tried a few of the recipes and adapted some of my own recipes to add veggies. So far I have put cauliflour puree in banana bread, carrot puree in satueed taco meat, and added sweet potato puree to pancakes (so yummy - I started this when I was using up C's baby food purees). I also add carrot puree to almost anything with tomatoes - chili, spaghetti sauce, even canned tomato soup. I keep ice-cube sized carrot puree (with a bit of green beans) in the freezer so I can even pop a couple into lunch sized portions. So I'm getting good at sneaking veggies into her food, but getting C to try food in its natural state is another story - she won't even eat grapes or strawberries, let alone a carrots or peas! I love the layered pop idea! The girls would love that! My dad's wife (I guess that would make her my stepmom ;)) felt sorry for us for the ice cube sized pops and bought us some real popsicle molds today. I will try the your layered version tomorrow. Thanks! This is such a great idea, and now that it's finally warm here, I'm going to make some popsicles like this. My 1 year old makes more of a mess, but hopefully he'll get the hang of eating them soon enough. your layered popsicle sounds delicious! I'm also pretty good at hiding veggies, but have had a lot less luck getting my son in particular to eat them in their natural state. This month's Today's Parent (Totally Toddlers) has some great layered popsicle recipes too. I wonder what happens that kids suddenly decide they won't eat those things anymore... especially if they loved them as babies! This is a nice idea. My son adores popsicles. And I totally agree about not needing to make the layers perfect. The kids don't care! I agree, it's tricky to get some kids to eat veggies - I'm always amazed at the ones who do without a fuss! And it's perplexing, because C used to eat almost anything as a baby! Maria - I'll check out the recipes in Today's Parent!